I came across this recipe from Fine Cooking years ago and fell in love. We make them all sorts of ways, using whichever herbs we have on-hand. Mom has enough fresh chives to sod the White House lawn so that’s what we used when we cooked this batch over the weekend. I asked for help naming these on the facebook page and was enthusiastically informed that the Pioneer Woman makes these also. STOP YELLING AT ME! I got it. I see. I see! But since I’m a food blogger and super, mega, tremendously appreciative of giving credit, please allow me to direct you to a few sources. For the recipe that inspired mine, please check out Fine Cooking’s Issue 83 from January 2007 for their recipe for Crispy Smashed Roasted Potatoes. And many of you also told me this is an Australian dish. Which I researched (you're right) and quickly found this recipe for Crash Hot Potatoes published in 2002 by Australian food guru and cookbook author, Jill Dupleix. And just so you’ll all put your pitchforks down, allow me to also direct you to the Pioneer Woman's 2008 recipe for Crash Hot Potatoes. 2008, people. And if you ever want to visit Australia, visit this site because it looks really informative. And in case you were wondering, potatoes probably originated in South America. And fries are made from potatoes. I like Wendy’s fries. Drive to Wendy’s right now and buy some french fries. Oh, wait! I have to thank Lory S. for helping me come up with a name for these! She suggested "Flat Busted" something-or-other and 'flat busted' took my mind straight to "Flat, Broke and Busted" and that's exactly what these are! Thanks, Lory!! Now, let’s get to where we cook some taters. HA!! I said "taters"! Didn't think I could do it!!! Long story. Boil potatoes in liberally salted water until fork-tender (cooking time depends on the size of the potatoes but I usually check for tenderness after about 15 minutes). Drain potatoes and place on a large baking sheet. Using the heel of your hand, a juice glass, a meat mallet, a potato masher or whatever gets the job done, press down on the potatoes until they’re flat, broke and busted. Drizzle each potato with olive oil. Top each potato with minced garlic then sprinkle with salt, pepper and chives. Bake at 425 for 30-35 minutes or until potatoes are gold brown and crispy around the edges (again, cooking time depends on the size of the potatoes). 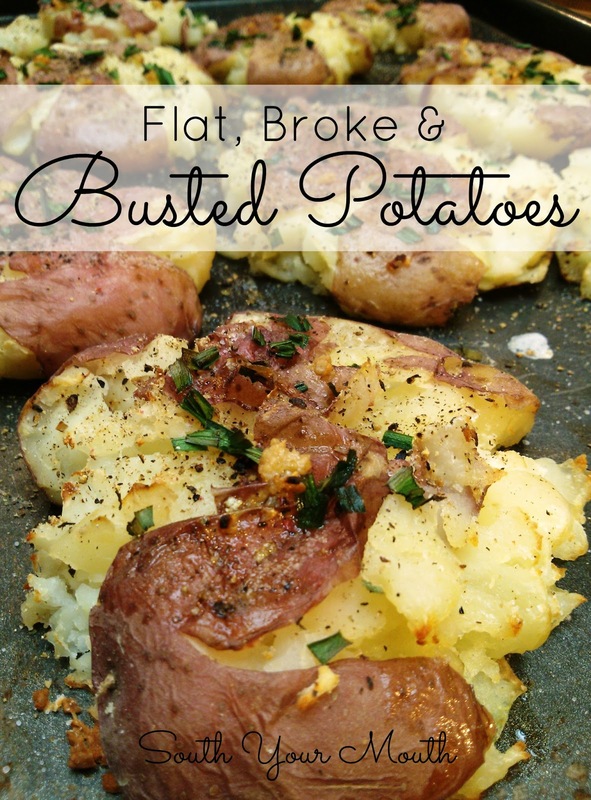 Instead of red potatoes can I use baking potatoes? of course I would think that cooking times may be longer. I wouldn't use the huge ones but I can't see why using small or medium-sized ones wouldn't work! Let me know how they turn out if you decide to try it! Got them in the oven now Mandy! YUM! had to LOL at your comment, "HA! I said 'taters.....Long story." you must be a clemson fan? LOL, looks like you dotted all your i's and crossed your t's. You know , taters are the best. I had always boiled red potatoes, sliced and fried the next morning after refrigeration to have for breakfast. They never were like my Mam' maw made on a wood stove. So, one night, wanting them then and there after boiling, I melted some butter flavored Crisco, and small amount of bacon. Added some sliced onions, and threw in the red potatoes. started fryin' and smashing with the spatula. Kept that up till crispy potatoes were had. did some more Crisco and fried on, salted, peppered, and served 'em up. That was IT!! Smashed fried taters like I ate from that wonderful table she sat with good food that stuck to your ribs!! A fantastic dish! Simple too - thanks so much for sharing at our Weekend Potluck table. Just made and ate these using onion/ garlic powder and bacon bits , I added a bit of butter on them for the last 10 minutes and topped with sour cream...DELICIOUS !!! No way you can have these potatoes and not liberally sprinkle them with some good Wisconsin grated cheese of your choice! THEN comes the sour cream. Oh yum! These potatoes look delicious. We all know recipes all float around and pioneer woman is famous for copying recipes. Any thin skin potato will do. Red, Yukon Gold, blue, or mix 'em up! Add some spring onions and top with a little grated Manchego cheese. Simple and easy to customize! Your sense of humor cracks me up! Oh yum...I love potato anything! Thanks for sharing..it's a definite pin! I made these for dinner last night. I sprinkled them with Parmesan cheese about 10 minutes before they were done. Delish!! So what if someone else makes them!! At least you credit your recipes unlike some who shall remain nameless. Made these with small new red potatoes and topped with bacon, cheddar cheese, sour cream and fresh chives. Taste just like loaded baked potatoes.